On September 7th 1951 my Great Grandparents; Marten Lolle Dykstra and Sjoertje Dykstra (VandenBosch) arrived in Montreal Quebec from Joure, Friesland, Netherlands. Along with them they had 8 children; Lolle (Lowell), Gretha (Margaret), Wiegertje (Winnie), Haije (Harry), Sjirk (Jerry), Gabe (Gary), Tetje (Thelma), and Pietje (Patricia). Marten and Sjoertje moved several times to find work; from Brantford, Exeter, London, and finally settling in Guelph. Their children all settling around these areas. As you can imagine this move to Canada was a major life changing decision; leaving behind all that they know including a trucking business with employees. I wanted to commemorate this moment; for the sacrifice, hard work, and faith they possessed in order to provide their children and future generations a prosperous life in Canada. 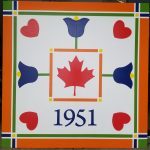 The Red maple leaf with a white background is in the center of the barn quilt, as becoming Canadian was important and embraced by the family. I also wanted to incorporate the colour Blue to represent the Netherlands flag of Red, White and Blue. The Friesland flag is also Red, White and Blue, and this is why the hearts were incorporated. This shade of blue along with a white background also remind me of the beautiful Delfware (or Delft) Dutch pottery I remember seeing in my Grandparents house while growing up. Finally, the color Orange was added, as it is the colour of the Dutch Royal family. The colour orange has come to symbolize the country and to signify national pride.